Roughtly 30 days before Christmas, the eyes of the world turn to Rovaniemi as the season is officially open in Santa Claus Village. 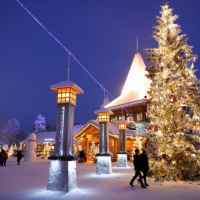 Despite the fact that the village of Santa Claus is open all year, this moment marks the start of the busiest season in Lapland’s capital, as numerous visitors come over to experience the true magic of Christmas in the Official Hometown of Santa Claus. Santa Claus’ original home lies in the secret mountain named Korvatunturi (“Ear Fell”) in Finnish Lapland. Since the exact location is only known to a chosen few, he decided to establish an office in Rovaniemi in 1985. Rovaniemi received the status of the Official Hometown of Santa Claus in 2010. Since 1985, Santa Claus has received 15 million letters from 198 countries, which makes Santa Claus’s Post Office a must visit on any trip to Santa Claus Village. The merry postal elves are happy to serve customers all year round in their headquarters, which is a proper post office managed by Finland’s national postal service (Posti). Every letter sent from here gets a special Arctic Circle postmark not available anywhere else, so you can be sure that your greetings home will be special and unique. If you want to see Santa right after landing in Rovaniemi, you’ll be pleased to know he is located only 3 km away from the airport. 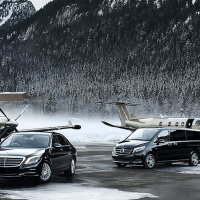 Private jets are welcomed at Rovaniemi’s airport and a private driver can easily take you to the Village in just 5 minutes. Or, even better, you can take a reindeer either a husky sleigh ride! Another highlight of the year is December 23rd, when Santa departs on his journey to hand out presents to children all around the world. Elves and all the other Santa’s helpers celebrates his departure and wish him good luck. Drawn on the ground, just in front of Santa Claus Office all its way towards the main road, you can see the geographical line of the Arctic Circle. Yep... You're really in the north! 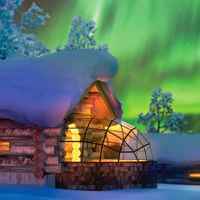 Lapland is also the best place to view the Northern Lights. Abisko national Park, about 5 hours northern Rovaniemi, is considered as one of the best places in the world to see this natural light show, thanks to its powerful winds which blow and maintain a clear sky. Contrary to popular common belief, the best times for spotting the Auroras are at the beginning and at the end of the winter season. There are some hidden marks, if you look accurately: when viewed from above, the streets of Rovaniemi, appear to be shaped like reindeer antlers. It’s curious to know that the number of reindeers in the province roughly equals the number of people. To better enjoy the Christmas atmosphere, try out our suggestions of a small Finnish vocabulary. Ask us for an instant quotation for your private jet and let us help you to plan your unforgettable experience of the real Christmas in Santa Claus Village.